Clorox has apologized for a seemingly harmless tweet about emojis that sparked outrage on Twitter. The tweet, which Clorox (CLX) since deleted, showed a Clorox bottle made up of the new emojis released by Apple (AAPL) as part of this week's iOS 8.3 update. Clorox tweeted, "New emojis are alright but where's the bleach." Apple's new iOS 8.3 release consists of 300 new emojis, including kissing lips, googly eyes and a smiling poop (we wish we were making that up). But they also include racially diverse emojis, including cartoon faces with brown and black skin. 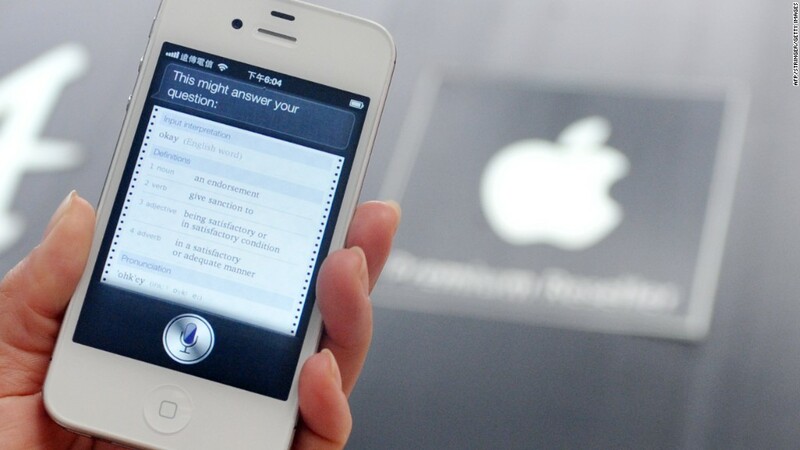 In its tweet, Clorox seemed to be commenting on why bleach wasn't included among the hundreds of other household items that Apple had added to its list of emojis. But on social media, offense was taken. "You need to clean up your PR person. Put some bleach on your distasteful marketing ideas," tweeted @DriNicole. "Black emojis were added today. Saying this implies you'd rather the emojis be only white, by adding bleach." 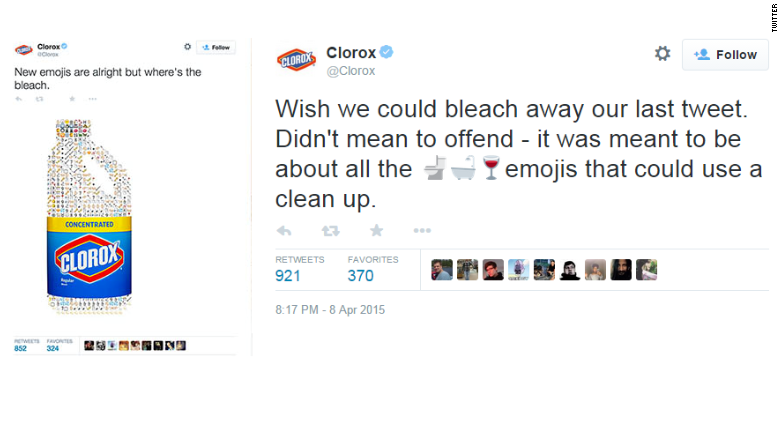 After taking down the tweet, Clorox followed up with an apology: "Wish we could bleach away our last tweet. Didn't mean to offend - it was meant to be about all the [toilet, bathtub and red wine] emojis that could use a clean up." "We apologize to the many people who thought our tweet about the new emojis was insensitive," said Molly Steinkrauss, a spokeswoman for Clorox. "It was never our intention to offend. We did not mean for this to be taken as a specific reference to the diversity emojis -- but we should have been more aware of the news around this. The tweet was meant to be light-hearted but it fell flat." Taco Bell launched a similar -- but far less controversial -- campaign earlier this year in an attempt to rally support for a taco emoji. In a looming update to the emoji system (for non-Apple devices), a non-profit organization called the Unicode Consortium that regulates emojis among other computer text, is considering 37 candidates for new emoticons could be added as part of a code update scheduled for June. The finalists include racially diverse emoji faces, a zipper-mouth face, prayer beads, a cricket bat and a taco.